Shanghai—Pearl Lam Galleries is pleased to present A Long Line Without a Word, a solo exhibition by Iranian artist Golnaz Fathi in Shanghai, China, on show from 26 May to 22 July, 2018. Gathering over 17 works, most of them new and recent, the stark and striking exhibition highlights Fathi’s delicate yet assertive works created in two styles: ink pen on canvas and acrylic brush on canvas—with the latter making its series debut in Asia. 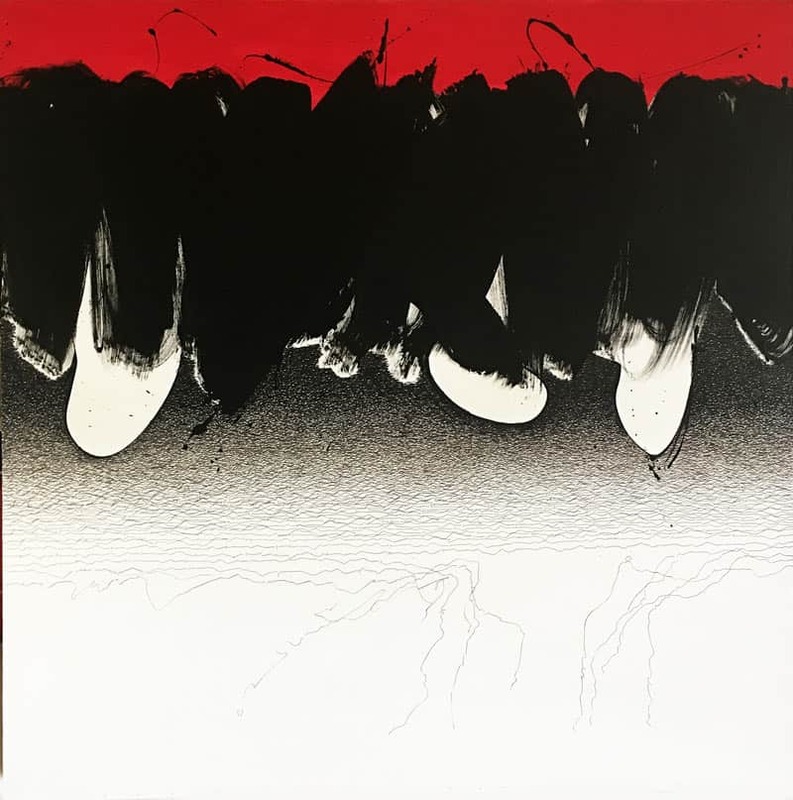 The polarity of the techniques complements one another in their respective details, while reflecting Fathi’s artistic practices as both a contemporary artist and a trained calligrapher. Rooted in traditional Persian calligraphy—a sacred form of art in the Islamic world—Fathi’s works break free from the disciplines of Arabic scripts. Under Fathi’s abstract spin, letters are reduced to lines; each word becomes illegible and diverges from its original meaning. Following the twists and turns of each line drawn under her intuitive gestures, viewers experience a rhythm that is universal yet uniquely subject to one’s own imagination. When examined up close, the seemingly minimal composition on canvas is composed of thousands of lines, the result of a painstaking process, delivering emotional responses that even language sometimes fails to communicate. Inspired by the technique known as Shiah Mashgh or “black practice”, a warm-up exercise where a sheet is repeatedly filled with black letters, Fathi considers this expression as the most free and artistic part of writing, for one connects body and mind in these spontaneous movements. Instead of consciousness, her pen is triggered from her meditation and eventually leads the direction of the lines. By taking delight in the laborious repetition of manual gestures and technical complexity, Fathi has stripped forms and languages of the anonymity of function, forcing them to speak on their own terms. Likewise emanated from an inner force, Fathi’s acrylic paintings combine both momentum and acumen. The artist finds empty spaces to be full of information and constructs her works to be specific to a space that is drenched in its own aura of imageries. She explores the tension between filling and emptying the canvas as a metaphor for the cycles of human life. Despite its minimalistic appearance, each wide brushstroke demands a high level of concentration and dexterity that only someone who practices calligraphy daily can achieve. Fathi creates another pen painting series with a similar composition of just a few horizontal or vertical strokes on the entire canvas while numerous expressive lines look as if they were created by a brush, resembling the marks of brush hairs. The two mediums reflect the paradox of improvisation and precision, while both are done on a clean background. If lines are the melody, then the vacant canvas is “the sound of silence”. In the triptych Knotted Roots, the meandering lines differ from most of her works, as they do not cross over one another but instead wind around neighbouring lines. Each thread is a unique narrative that is closely related with other “roots” nearby. Likewise, just like rhizomes hidden under the soil, the grey lines blend into the cream background, giving the canvas a mysterious sentiment. Fascinated by how calligraphic traces can have a different effect on non-traditional mediums, Fathi projects a version of this work in the exhibition space. In contrast to the almost all-white canvases, the colourful lines dance on the dark wall as if they represent the rebirthing of nature. Fathi simply invites audiences to untie the knots and unearth the meaning behind the work, which has no end or destination other than showcasing the beauty of simplicity on her own terms. Golnaz Fathi was born in Tehran, Iran in 1972. Her work is transnational both in conception and execution, as it incorporates her extensive training in traditional Iranian calligraphy, graphic design, painting, and autobiography. Her paintings carry traces of meaning that have no known coded alphabet. The strength of her work stems from the drive to express emotions that cannot be pinned down into words. She has also exhibited widely in galleries and museums in South Korea, New York, Geneva, Dubai, London, Tehran, Paris, Hong Kong, and Singapore. Her work is part of the permanent collection of the Metropolitan Museum of Art, New York, USA; Brighton & Hove Museum, England; Carnegie Mellon University in Doha, Qatar; Islamic Art Museum, Malaysia; Asian Civilisations Museum, Singapore; The British Museum, London; Devi Art Foundation, New Delhi, India; Farjam Collection, Dubai; and The Devi Art Foundation, New Delhi, India. She has also received numerous fellowships and grants, including resident scholarships to study at Fabrica (Treviso, Italy) and Cité Internationale des Arts (Paris, France).